Rummaging thru old boxes in the garage can unearth surprises, long forgotten. Here we see the first picture I ever took with a 'serious' camera. A Minolta x-570 manual SLR now considered to be a well-made classic in the advanced amateur cost range. It works fine; I still use it every trip. 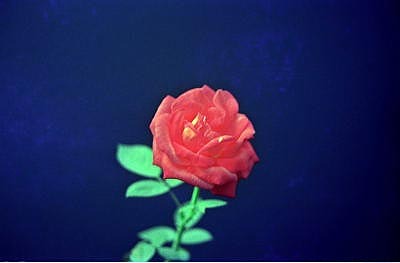 This shot was taken on auto with Fujicolor ASA 100 print film. At the time, my reaction was delighted surprise that it worked the way it was supposed to. Today my reaction is a quiet relief that I've had plenty of time to practice over the years. The other day, I was rummaging thru my garage and came across four dusty, mildewed 3-ring notebooks stuffed with polyvinyl slide pages all sticky and kinda glued together from humidity and who knows what. They were labeled: “Extras, Culls, and Used Titles” – 1984, 1985, 1986-1988, and 1989-1998. I’m pleased to report that these are authentic archaeological relics that thankfully survived my grand slide-library throwout about 10 years ago, right after I began to believe (falsely) that I knew how to take a good photograph. With that pissy attitude, I viewed much of my earlier work as crude juvenilia, an embarrassment of sorts, best destined for the trash can. Many hundreds and thousands of slides ended up in the local landfill - a ruthless plundering of my earlier mistakes, my juvenilia, a comprehensive narrative of my determined struggle to learn and grow as a photographer. I now deeply regret that ill-considered impetuous act. Even a bad snapshot can provide a superb record of where I was at the time, what the weather was like, what I was seeing then and how I approached the shot. 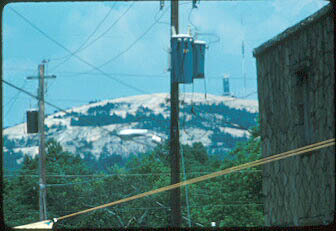 Like this view of Stone Mountain -- an early attempt to juxtapose urban clutter and subjects best left uncluttered. So, here’s new category: Culls. Maybe, Better Living Thru Culls. After all, only a photographer can love his culls.